Kwesi Pratt Jnr. the Convention People’s Party (CPP) member who has virtually become the unofficial spokesperson for the National Democratic Congress (NDC) has predicted doom for the ruling party in 2012 if it does not swiftly put its chaotic house in order. 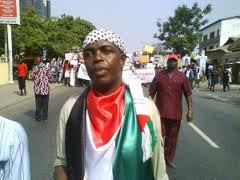 A seemingly frantic Pratt says the ‘internal insurgency’ happening in the NDC could take the party back to opposition. Mr. Pratt, Managing Editor of Insight and a leading member of the moribund Committee for Joint Action (CJA) told Citi FM, an Accra-based radio station that there seemed to be deliberate moves by some NDC top guns to ensure that President Mills failed at all cost. He said there was currently a raging “internal insurgency” within the ruling party, with key insiders making serious efforts to crush the Mills Presidency for their own parochial political interests but added that President Mills did not appear to appreciate the seriousness of the internal threat to his two-year-old presidency. “All these agitations and sometimes downright insults of the president and manoevouring by some foot soldiers point to a certain strategy to replace the president and that is why I call it the state of insurgency. It is about regime change, it is a particular power struggle aimed at replacing the president,” he said. Without mentioning names, Mr. Pratt warned that the growing internal opposition to President Mills will not inure to the benefit of the key insiders leading the attack, but may rather result in a possible return of the opposition NPP to power. “The blow which will send NDC to the canvas will not come from the New Patriotic Party, it will not come from the Convention People’s Party, it will be a self-inflicted blow; it will be an NDC blow which will send the NDC to the canvas,” he warned. “I do not know how the regime is going to deal with this problem, but quite frankly, opponents of the regime are very happy with this situation. The regime itself does not appear to have understood the full implications of this internal insurgency; they don’t seem to realize that this can send them to the canvas, they don’t seem to realize that if the current trend continues their task of winning the next election is going to be far more difficult than it has ever been,” he said. The chances of the NDC retaining power in 2012 are getting slimmer by the day with the ruling party’s own media, elements, apologists and propagandists all doubting their ability to win the general elections. Since coming into office about 19 months ago, the government has not known peace within the rank and file of the NDC as leaders are caught up in the web of power struggle with others accusing the President of presiding over a ‘go-slow’ ‘Team B’ government some of whom are said to be ‘boot lickers’ and ‘greedy bastards’. Kofi Adams, Deputy General Secretary of the NDC and spokesman for Former President Rawlings and his family, has also emphasized that the factionalism within the NDC is real. He was however quick to point out that factionalism should not contribute to the break-up of the party adding that it should rather be harnessed to the advantage of the party while at the same time cautioning that perceptions of factionalism could result in the party’s downfall. While bemoaning factionalism within the party at a time when President Mills needed the support of every NDC member to make the government succeed, Mr. Adams was virtually canvassing support for former First Lady, Nana Konadu Agyeman Rawlings to become the party’s flag bearer when the latter has not ‘officially’ declared her intention to contest President Mills in the NDC primary.